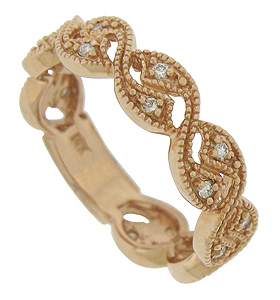 Pairs of twisting vines curl around the face of this lovely floral wedding band. The curving leaves are set with fine faceted round cut diamonds. The delicate design is edged in milgrain decoration. 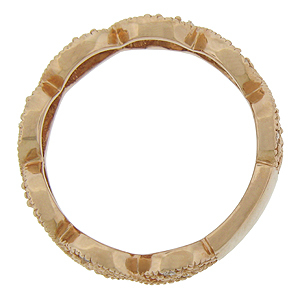 The wedding ring is crafted of 14K rose gold and measures 5.40 mm in width. Size 7. We can re-size or order in any size. Also available in white gold, 18K, yellow gold and platinum.